Located in the capital of Brunei, Bandar Seri Begawan, Negara Brunei Darussalam, Anggerek Desa Technology Park Phase 3 was an exciting project for P.A.Y Architects. After a year of intense construction activities, it is now ready to cater to international and local companies in the creative and information technology industry. Initiated by the Brunei Economic Development Board (BEDB), the USD 14 million Design & Technology (D&T) building, together with a multi-storey car park, was designed to complement the establishment of the iCentre and Knowledge Hub as a step in progressing towards a full-fledged Anggerek Desa Technology Park (ADTP). The project features a "green" office building with a Green Mark Gold Certification from the Building and Construction Authority (BCA) of Singapore. 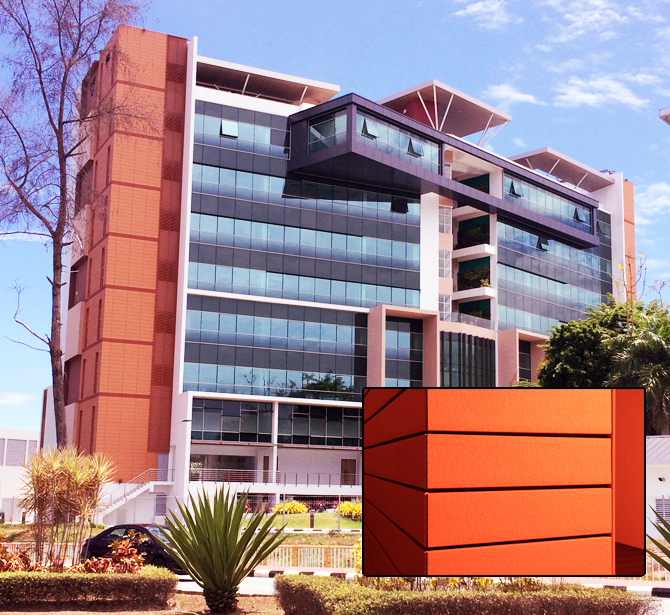 The use of Hunter Douglas NBK Terracotta Facade panels allows the architect, P.A.Y. Architects, the creative freedom to contrast the modernity of glass with the traditional art of terracotta. Additionally, a key feature of these panels is the proprietary facade solutions. NBK Terracotta Facade is a ventilated curtain wall / rainscreen system whose exposed components are made exclusively from terracotta. Using a ventilated system, water is moved away from building envelopes, a natural chimney effect is thus created, keeping the building dry to reduce maintenance as well as to save energy. If you would like to receive further information about the use of Hunter Douglas NBK Terracotta Facade system on this project, please click here and send the automated email to us or alternatively go direct to our website.